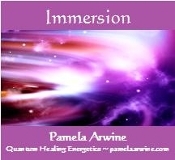 Imagine yourself being immersed in a vast ocean composed of the most wondrous energies of the universe. Imagine yourself basking in the warmth of the unconditional love of the highest, most loving and enlightened beings of the universe. Imagine yourself on a cosmic journey, floating in pure awareness of your God Presence, your Oneness with All That Is. This is Immersion. Single CD. 70 min.